LEA education programs are always growing and changing to meet the needs of our students and the teachers we work with, and to reflect the interests of the public. Our education programs are funded through the generous contributions of our members and through grants. 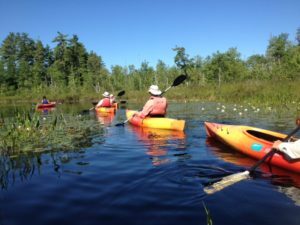 We are very active in the local school district and we try to offer a variety of programs to pique anyone’s interest, whether it be identifying wetland plants in a light drizzle or joining Sportshaus for a kayak paddle, or partnering with Loon Echo Land Trust for a guided hike. Our programs are offered at a reduced price for members (or free!). Please consider becoming a member to support our growing programs and to help foster environmental stewardship in the Lakes Region!
. Students will collect macroinvertebrates in the fall and spring, then identifying, photographing, and releasing the insects back into the water. They upload their photographs and written evidence to a statewide website called Vital Signs that focuses on a number of investigations ranging from how invasive species affect biodiversity to measuring native plant ranges, to assessing water quality. Students are practicing their scientific writing and documentation, and literally immersing themselves in the habitat, giving them a front row view of the aquatic food web, ecosystem connections, and understanding human impact. The program focuses on supporting Next Generation Science Standards and prepares students for deeper investigations in the Middle School. 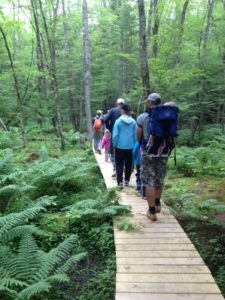 This program is partially funded by the Lake Region Garden Club and received a grant this year from the Gulf of Maine Research Institute and the Maine Outdoor Heritage Fund. 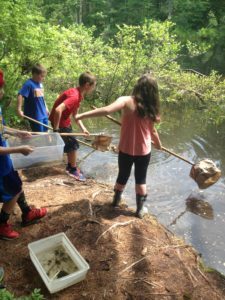 In this video, fifth grade students are part of a trout fry release along the Stevens Brook! The Living Connections Program is a year-long watershed education program in sixth grade. LEA’s teacher/naturalist visits classrooms twice per month to teach students about Earth systems, focusing on the hydrosphere. Students begin the year with an exploration of water properties. Lessons on watersheds, the water cycle, groundwater, aquatic insects, trout ecology, and wetlands create a foundation for understanding interactions between the hydrosphere, biosphere, and atmosphere. The second part of the year focuses on threats to water quality, including invasive species and erosion. This portion of the curriculum introduces the concept that human actions can affect the quality of Earth’s systems. The culmination of this program is the Hey You! Cruise (see below). The Adopt-a-Trout program is an additional component of the Living Connections Program, as students raise brook trout from eggs to fry and release them into local rivers. In June, echoes of “Hey You!” ring out over Long Lake as students participate in the annual Hey You! Cruises on the Songo River Queen in Naples. The Hey You! Cruises serve as the culminating activity for students in the Living Connections Program and as a special program for students at Waterford Elementary in Oxford and Sebago Elementary. Volunteer actors at stations along the east and west shores pretend to do things that are harmful for water quality, such as bringing in sand to a beach, cutting down the vegetative buffer, or taking a bath in the lake. Students on the Cruise have learned over the course of the year that these actions degrade water quality. So, to stop the transgressors, they yell out a resounding, “Hey You!” The Hey You! Cruises are a great way for students to make the connection between their in-class learning and real life application, allowing them to put their knowledge into action. The Field Studies for Middle School Students Program is currently offered to all seventh grade classes at Lake Region Middle School. This program is designed to encourage students to understand ecosystem processes through direct contact with the natural world. Students engage in inquiry-based field science activities to collect and analyze forest ecosystem data. They also develop science communication skills through oral and written reports. LEA’s teacher/naturalist leads students to a forested area behind their school to explore the ecosystem twice a month throughout the year. Sensory development lessons at the beginning of the year help students understand that use of the five senses is essential in scientific processes. Students establish fixed-radius research plots and through a combination of field and lab-based activities, students collect qualitative and quantitative data about ecosystem components. 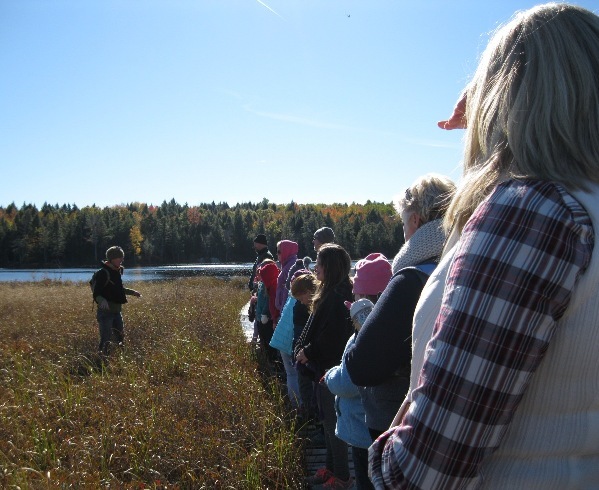 At the end of the year, students visit the Holt Pond Preserve to extend their learning by comparing forested and wetland ecosystems. As a culminating synthesis, students create a field guide or other product to demonstrate their understanding of ecosystems as the relationships within the environment that change and cycle over time. The physical science unit at the middle school level focuses mainly on water chemistry and the physics of erosion and weathering. Students perform experiments to explore the physical effects we can have on the water and land around us. Students are also exploring climate change and human impact on our natural resources. LEA supports learning in the 9th grade with lessons on global water supply, shore land zoning laws, climate and erosion. 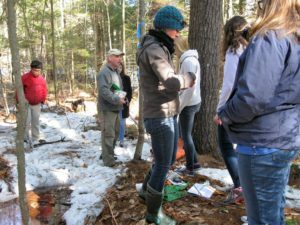 We offer programs through the Junior Maine Guide class on invasive species and tracking and join the Natural Science class to update the Forest Inventory Growth (FIG) plots at the High School, which focuses on tree identification and growth over time. Shane Duigan, our district forester, joins us on our outdoor excursions. In 2018-2019 we are working once more with a group of 15 invested students to bring back an Envirothon team to Lake Region! The Envirothon is a national competition where teams of 5 have their knowledge tested in forestry, aquatics, wildlife, soils and then present on a current environmental issue. We are not sure yet of where our regional competition will take place in Maine. Our teams are young and excited and we hope to continue to build their knowledge in the coming years. This inspiring addition to our programs is being partially funded by an anonymous foundation. If you would like to help in supporting our trip to the regional competition and our registration fees please contact alanna@leamaine.org and keep an eye out for our fundraising efforts! On a more individual basis, LEA provides internships and courtesy boat inspector job experiences to many high school students. These experiences enhance students’ college applications and provide real exposure to environmental career options. LEA loves to connect with homeschool families and regularly offers materials, ideas and curriculum, and local excursions for students learning outside of the norm. It is always a pleasure to work with homeschool groups because they have the opportunity to take time, focus in on a particular unit of study, and tweak investigations to suit their needs. One of our homeschool groups is helping in the macroinvertebrate study from the 5th grade, and have several field sites that they are monitoring and uploading to Vital Signs. Interested in learning more? Please contact alanna@leamaine.org. The Lakes Environmental Association offers outreach programs throughout the year as part of the Natural Resources of the Lake Region Series. The goal of the series is to encourage a connection to place through exploration of the remarkable lakes, streams, wetlands and woodlands of the region. We believe that a strong connection to place will foster and strengthen watershed stewardship. Guided walks and natural history presentations are supported with help from Hu and Raynor Caplan. Dr. Caplan is a former LEA Board President and Mrs. Caplan served LEA as Board Secretary. In speaking with a number of our students we have found that parents don’t want their kids outside alone, but are often so busy that they don’t take them outside either. LEA is committed to helping families venture outside together through regular walks, family interaction, and increasing comfort and familiarity in the woods. Many of us remember being in the woods as children and how it fostered a sense of mystery, confidence, inspiration, stillness, imagination and individualism. Being outside as children is also a leading factor in developing a sense of place and increases stewardship as adults. In 2018 BOGS and the Outdoor Foundation provided an in-kind grant of BOGS boots to help families gain access to the outdoors with proper footwear, whatever the weather. Here is a video about our experiences! 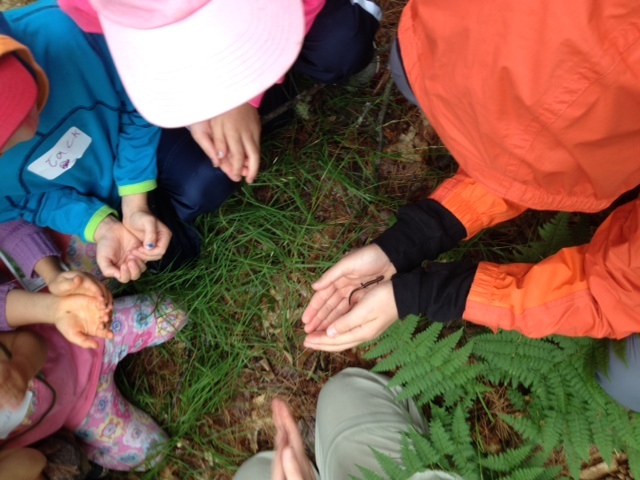 For more information about BOGS and the 2% for Outdoor Education program, please click here. Our children, and our families, need the woods and wild places now more than ever. Please join us on our family nature walks and get back outside! Holt Pond is LEA’s outdoor classroom. With different ecosystems within walking distance of one another, Holt Pond provides the perfect opportunity to learn about nature in its varied forms and functions. 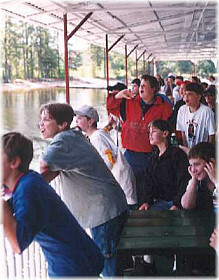 Holt Pond is a favorite field trip for local school groups. Trails are an essential part of the LEA education program, as the best way to teach about the environment is to bring people into it. LEA hopes to expand the Holt Pond part of the school-based education program. 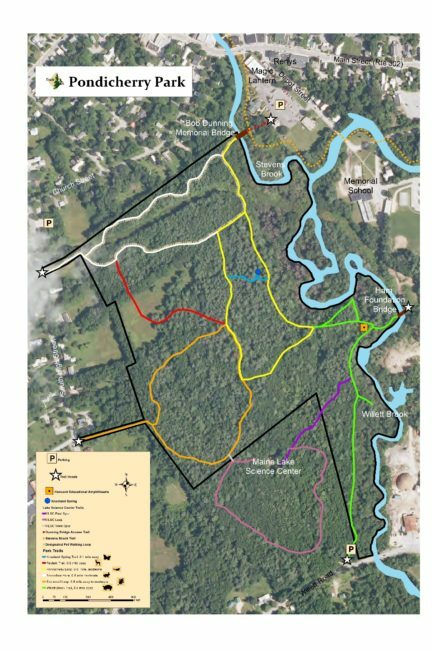 Pondicherry Park is a 66-acre tract of land in the center of Bridgton, where visitors can step away from the busy streets into the quiet of the park’s forested trails. Within the park, visitors find a wide variety of ecosystems for hands on learning and exploration. These diverse ecosystems just beyond the majestic Bob Dunning Bridge have been the location for many of LEA’s Caplan Series events including tree identification walks, animal tracking investigations, scavenger hunts for families, and native herb walks. We are also partnering with the Bridgton Historical Society to offer programs that focus on both local history and nature. Not only is the trail system in Pondicherry Park a fantastic location for adult educational walks, but it also provides an expansive outdoor classroom for student education as well. Click the map for a printable version. Pondicherry connects us to the Pinehaven loop trail at the Maine Lake Science Center. Follow the Ray Bradburian boardwalk (think Butterfly Effect in ‘A Sound of Thunder’) to the evergreen tree trail markers from Bruce Hilton’s wood shop at the high school. This sweet addition to the Pondicherry trails weaves visitors through young tree stands, past an old car in the woods (keep your eyes peeled! 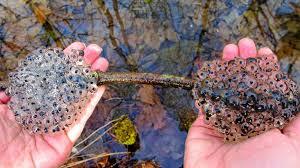 ), over streams, and by wetlands. Stand near the stone wall and close your eyes to imagine the whole landscape cleared of forest and instead harboring bleating sheep or crops marching along in rows. We live in an area rich with history, and our mark on the landscape is all but forgotten in the quiet whispering of the pine trees. Be on the lookout for an interpretive trail and some fun changes in the works for our younger visitors! Alanna Doughty is our Education Director. She received her Bachelor’s degree in Ecology and Environmental Science in 2005 from the University of Maine in Orono after attending Alaska Pacific University and College of the Atlantic. She returned to school at USM for a Masters in Education, and finished in 2011, just shy of her daughters second birthday. She also spent time working for Outward Bound, Ocean Classroom, and Winter Journeys and loves being outside. She graduated from the Lake Region School District and is excited to inspire students in learning about our local ecology. She brings her enthusiasm for the outdoors in general and wetland plants in particular to the table, and loves being a part of the educating crew at LEA.